The CueSight laser-sighted pool cue is designed as a training aid to help a player improve his or her stroke. A removable laser in the tip of the cue shines a crosshairs straight ahead onto the cue ball. As you stroke, you can see in real-time any inaccuracies in your stroke, allowing you to correct the problem as it is happening. Any pro will tell you that the key to a consistent game is a consistent stroke. 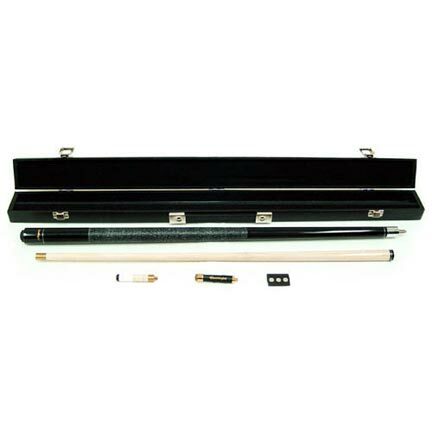 The original CueSight set includes: top-of-the-line maple pool cue with pressed Irish linen wraps and stainless steel joint; CueSight crosshairs-projecting laser sight; conventional wooden end for non-laser play; TWO sets of batteries; attractive and durable velvet-lined hard box case; Owner's Manual; and a LIFETIME WARRANTY!